Sheryl Nussbaum-Beach and Will Richardson, in their implementation of the Powerful Learning Practice, hold ‘co-construction of knowledge’ in high regard. But, I dare say, as with other constructs, each of us has different understandings, impressions, implementations, and nuances of just what co-constructing knowledge means. After all, as is said, “The reader writes the story”. 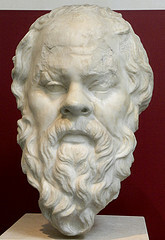 Did you know that Socrates was extremely upset with the invention and adoption of the written word? He made a number of claims (topic for another post! ), one of which was that people would read the printed words superficially and would not – could not – come to deep understandings without conversation. He believed that words were not reality – they represented realities – and, for ideas to be deeply understood, there needed to be conversation, debate, disagreement, clarification, elaboration. So I will suggest that one of the essential requirements for co-construction of knowledge is exactly that – conversation. This typically involves language – spoken or written – easily accomplished technically in this day and age. If you are interested in ways of supporting online conversations among students read Scaffolding for Deep Understanding or if you question the benefits of groupwork read Why Should Students Collaborate? Perhaps when you think of kids collaborating on a project, you might see all the kids in any one group negotiating every decision and producing one artifact together. This is often a challenge as you well know. There are many teamwork issues that arise. Teams do not always function well. Gavriel Salomon speaks of the ‘free-rider effect’ where a team member leaves it to others to complete the task. Consider the ‘sucker effect’ whereby a more active member of the team is taken for a free ride by other members. Or think about ‘status sensitivity’ where high-ability or very active members take charge and rule the roost in spite of the others. Others have talked about ‘ganging up on the task’ whereby all team members just divide up the task to get it done as quickly as possible! These are all common phenomena. There needs to be genuine interdependence – a super-ordinate goal. Salomon suggests that the whole environment be designed to maximize mindfulness and interdependence. Let’s look at some different ways this might work. I’ll do this by sharing examples that evolved in some of my classroom work. Will Richardson has spoken about teaching kids how to author with hypermedia. I would agree and have done a lot of that since the early days of HyperCard in the mid-eighties! These skills can be applied to the co-construction of projects as well. When students across a group, or classroom, are determining their projects, it is often the case that there is an over-riding theme such as The Human Body, Geographic Regions, etc. As a result, students may pick a section of that theme – such as The Circulatory System or Prince Edward Island. Encourage and support students to have conversations about their projects. This can happen face-to-face and/or online. Each of these has distinct advantages for learning. If you have read other posts in this blog, you know that I am a big fan of collaborative journal writing. This can provide a forum for information exchange about both the content of the hypermedia project and the processes and strategies used by others. As a result, we see greater linking of knowledge (both within the students’ media projects and also across their individual projects). The following example illustrates students planning to link their projects. Collaboration may lead to insights that might not occur without the benefit of the discussions and interactions. It can be said that groups are not just a suitable way to collect the individual knowledge of their members but that they cultivate insights and solutions that would not otherwise occur. Collaboration, therefore, may lead to a ‘whole’ that is greater than the sum of its parts. You can see that the expectations for Larissa were now increased and that an opportunity for significant learning has been created. It may be that as the individuals decide on their projects, that there is a decision to have an overall project, e.g., The Human Body. 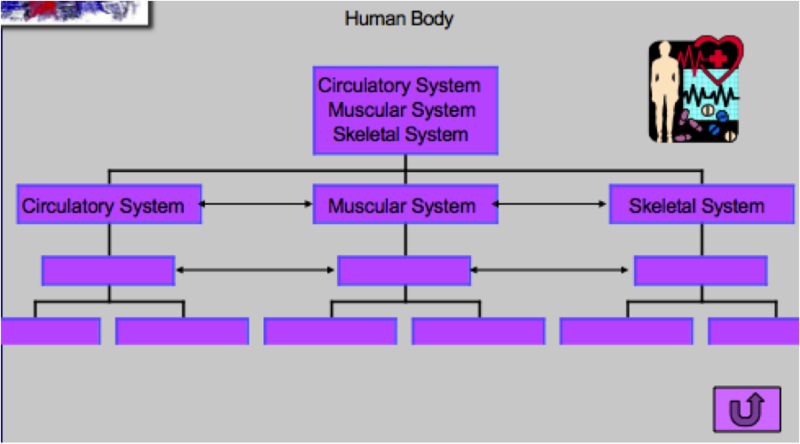 Each student might have a responsibility for part of that, e.g., Circulatory System, Muscular System, etc. Notice that the links are not just from the menu ‘down’, but that there are also links ‘across’ the topics of different students’ projects. This has the benefit of encouraging both understanding of the relationships among the systems but also encourages students to have an explicit understanding of the work of all the other students in the group. In order to be successful at this, students MUST have conversations (F2F or online) about their discoveries and creations. …encourages students to have an explicit understanding of the work of all the other students in the group. Such ‘thoughtful’ environments can be supported with many tools these days. The trick is to get students to use them intentionally to bootstrap ALL classroom members to a higher level of understanding both the content and processes of learning. Have students write their goals, thoughts, plans, frustrations, and reflections as they go through all phases of their project. Organize it so that the ‘journals’ are available to other students in the class (perhaps organized into groups). Each student will be responsible for maintaining their own journal as well as engaging in written conversation with other group members. Each student will have the responsibility to, not only write in their own journal, but also to engage in a written conversation with the other students in their group. Build scaffolding in for both the initial writings and also to encourage and support substantive conversations among the students. It’s not enough to be social. Cognitive contributions are also necessary. This is why I have suggested scaffolding. Kids often need support to know how best to ‘help’ their classmates. Having said all that, I have to say that that the danger with prescriptions is that their prescriptive nature becomes like another worksheet as mentioned in Scaffolding for Deep Understanding. I believe it is more important that one understands deeply the principles and characteristics of deep learning rather than prescriptions. When you understand the intentions, you can allow and encourage things that happen naturally in your classrooms. ‘Hidden’ describes an example of a co-construction that went well beyond my expectations. It arose naturally, spontaneously and was student-driven. Even though I have written this post with students in mind, please consider these same principles for professional learning projects that are being co-constructed by teams of educators. It works! I have not focused so much in this post on other aspects of project-based learning – such as having students generate driving questions and so on. Don’t think I’ve ignored it! Read more about that here! Although I will not debate here that one can co-construct alone. This ethereal discussion (for another post) would suggest that the act of writing, or creation alone, actually engages an inner dialectic among parts of ourselves – our rational self with the affective self, etc. Previous Previous post: Reflective Cognition vs More Information: It’s a Choice! Next Next post: Join Global Dignity Day! Excellent blog entry (plus the links to scaffolding). My question is how you would address this issue in a non-tech environment. Thank you. I have also done this kind of work in a ‘paper-based’ environment. I actually set up collaborative paper journals that were available for kids to access in the classroom. So each kid had his/her own paper journal and each was a member of a group. So the group journals were kept in a pile in a particular location. I had all the journal and conversation starters in the journals too. The problem was that the kids tended to answer them more like ‘school’ tasks. Their responses were briefer and less conversational than what I got online. I also, in either case – F2F or online – had lots of thinking prompts around the classroom – really indicating that ‘thinking is a highly valued activity’. I could imagine kids in a group putting their ideas and thoughts on chart paper that is posted around the class. One of the issues is really about finding ways for the kids to make their thinking explicit – to themselves AND to others in the classroom. And then helping them understand that reading the thoughts and ideas of others is a useful thing to do. If you can think of other ideas, please let me know. Hope that is helpful! Wonderful! Thank you for the ideas (my students already have Inquiry and Reflection Journals but wanted to make thinking even more visible). I will share this with the teaching staff! Enjoy! I look forward to learning from your efforts with these kinds of things. May I cite your Socrates paragraph on needing conversations for deep meaning? I would like to include this (as a text wrap around) in a chapter/book on peer review. I would attribute to you and cite your blog in the reference section. Any book profit is going to charity.